Listening to music while driving the car is the best way to relax inside the car and keep your mind away from the maddening traffic outside. If you want to listen to a specific song or a certain podcast or an audio book, then you will need an FM transmitter. 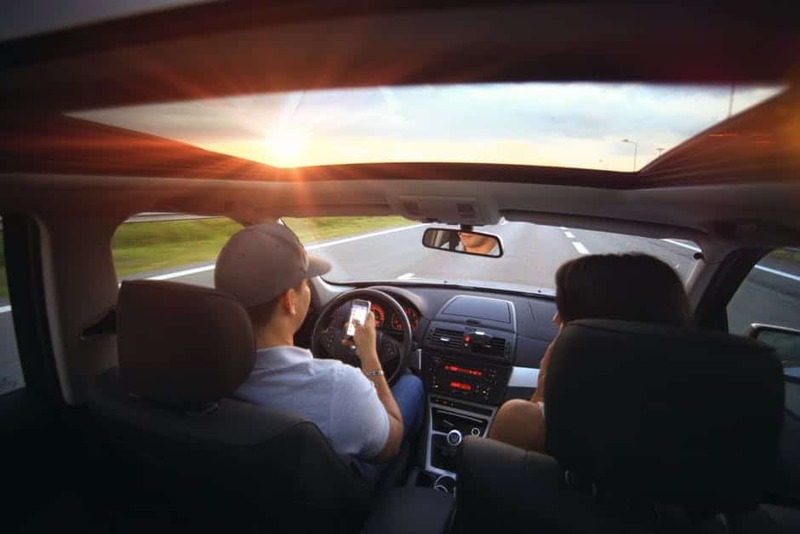 The FM transmitters are devices that can be plugged to your cars lighter socket and then can be connected to your iphone or any other Smartphone via the Bluetooth or through a cord. This will transmit the signals from any of your portable devices to the FM radio. The following FM transmitters will make sure you are never away from your favorite music at home or even while on the road. 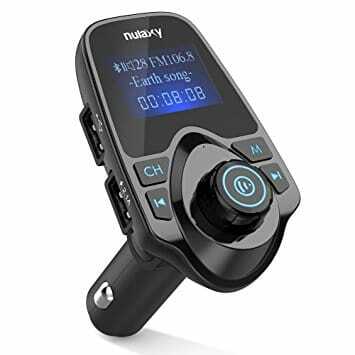 The Nulaxy FM transmitter is highly rated worldwide for its functionality and aesthetic design. 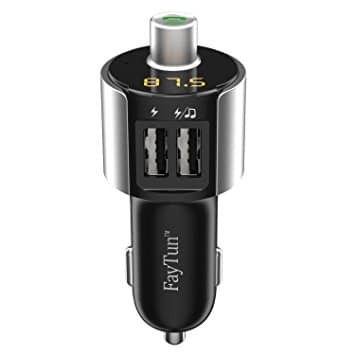 The best part of this FM transmitter is that it uses the latest Bluetooth version (3.0) for the most reliable and fast connection. This iphone FM transmitter for car is compatible with a broad range of products like iphone, iPad, iPod, tablets, Smartphone’s or mp3 players. The latest version includes some extra features like sleep/wake mode as well as it supports three source of input from Bluetooth, TF Card and USB. It features a clear LED display that makes reading pretty easy, has ergonomically designed buttons, sound dial and wireless Bluetooth connectivity. 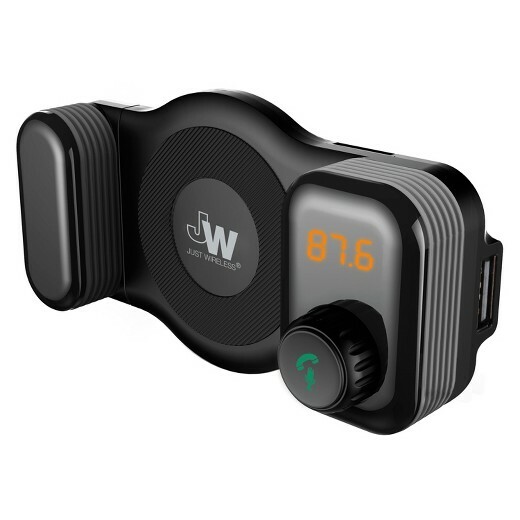 The built-in Bluetooth offers hands free calling, but the main feature that adds value to this product is the audio streaming throughout your cars stereo. The sound quality is crystal clear using the KM20 FM transmitter technology that has better noise cancellation and interference for the best sound output. The FM frequency this transmitter works with starts at 87.5 and rises to 108.0. This can be easily changed due to the large ergonomically designed buttons. The device comes with the included 5V-2.1A charging port, built-in microphone that makes taking the incoming calls easier and an auxiliary port. 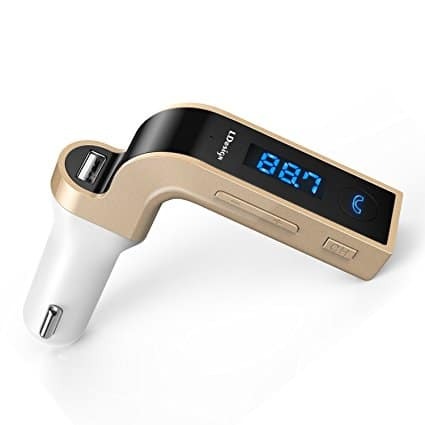 Overall, the Nulaxy Bluetooth FM transmitter is one of the best FM transmitters for your car, making it highly popular worldwide for the features and low cost. This is one of the cheapest android FM transmitters for car, but that doesn’t mean this device has less features. 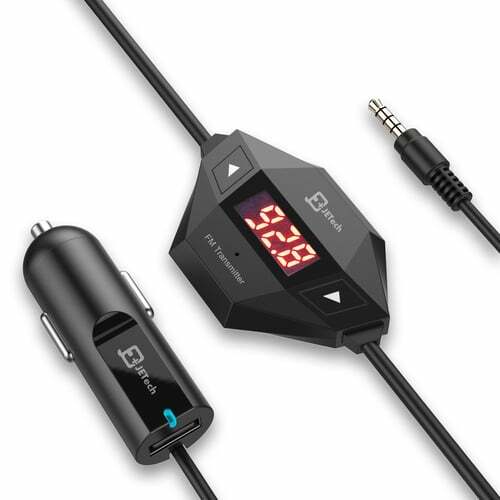 This is a simply designed FM transmitter that connects to the Smartphone through an AUX Cord. The plastics used in this device are of high quality and the buttons are sturdy. It also important to note that, this transmitter is not compatible with the iphone 7+ Smartphone, since there is no AUX port on this phone. You will require a Bluetooth to AUX adapter to use this transmitter. The device comes in a variety of colors, like pink, gold, white and black. This transmitter has an easy to read display with buttons that are easy to operate. It comes with an extra USB port, so you can change the devices while you are driving. The FM frequencies range from 88.1 to 107.9, making this a simple FM transmitter that will not burn your pockets, but will go on working for years. This FM transmitter has a simple design, but comes with some great features. It is compatible with most of the current generation devices. It provides crystal clear and high quality audio when it is connected to an iphone via a Bluetooth. The Bluetooth 4.2 picks up new devices easily with less effort. The transmitters face is easy to operate even for the least tech savvy person with features like smart car locator, dual USB charger and CVC technology for the optimal audio quality. You can play music from 206 stereo channels or even from your MicroSD Card. Simply connect this device and you can enjoy the music and phone calls without any interference. The LIHAN FM transmitter comes with a dual USB car charger on the face for easy access. The hands-free Bluetooth FM transmitter comes with a 3.1A and 1A input offering both 12v and the 24v charging for you and the passenger. The multifunction keys offers ease of use once it is connected to the tablet or to your mobile device. Play whatever you want from your collection through your device or a TF or USB Flash card. The wireless Bluetooth 4.0 connectivity consumes less power with just 5 percent loss of battery to your device each hour. For hands free calling, this deice comes with a microphone. The device is easy to use and universally compatible making it one of the loved brands. The LDesign FM transmitter is completely different from the various Bluetooth devices on offer. 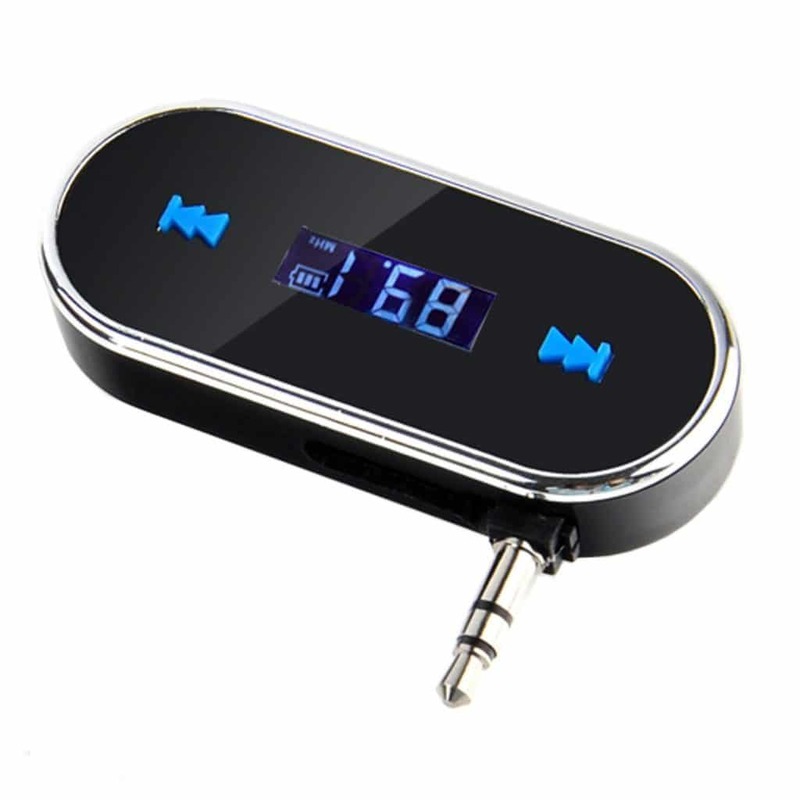 Available in 7 different colors, this FM transmitter has a very modern look with a small LED display. The frequency ranges from 87.5 to 108.0. The LDesign FM transmitter is compatible with Bluetooth enabled audio players, a USB Flash disk port and a TF card slot. The device automatically plays MP3 music to the car’s receiver with an echo-free CVC noise cancellation technology to provide best audio quality. It has features like A2DP sound processing that provides better sound processing. You can take calls while driving because of the built-in microphone feature. Once this is connected to the cars cigarette lighter its 5V/2.5A USB charger provides enough power to quickly charge number of devices. Given the size of the transmitter this light weight device does enough to qualify as one of the best FM transmitters for your car. This is a small and compact FM transmitter weighing only 34 grams and comes with one-inch LCD screen. The FM radio transmits frequency in the range of 87.5 to 108.0 MHz, making sure you can play music through your iphone. This compact device packs in Bluetooth functionality for a more stable and little less plug and play connection. Once connected to the cigarette lighter port, it will turn on immediately and can be easily controlled through the buttons on the device. This FM transmitter is not only compatible with iphone, but also various android devices too. It comes with a microphone allowing you to operate seamlessly without your hands if it is connected via Bluetooth. The device comes with noise cancellation feature that means the device provides high quality sound. Finally, there are dual built-in USB chargers, so you can plug-in and charge your devices. 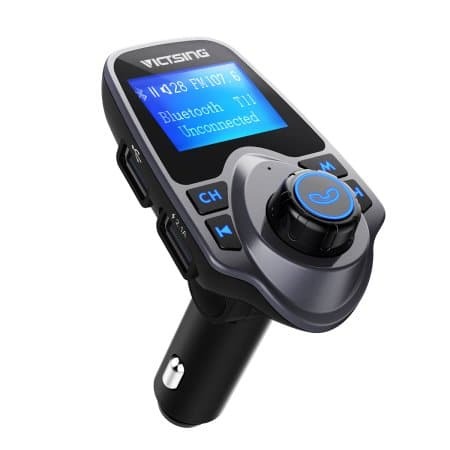 VicTsing is an alternative to the Nulaxy FM transmitter with very similar features. 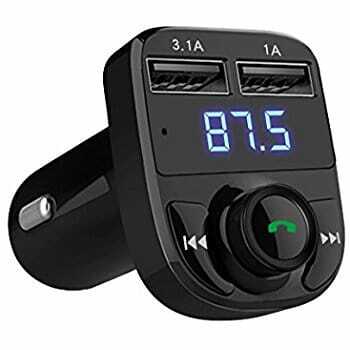 Just plug this device to the cigarette lighter of your car and you can play music through the car speakers via the Bluetooth, AUX, USB or the TF Card. You can charge the Smartphone as well as play music through the same USB port. The VicTsing is a Bluetooth hands free car kit and the incoming caller ID is displayed clearly on to the 1.44 inch LCD screen. It comes with the latest 3.0 Bluetooth with range of 5 meters. This device is at par with the Nulaxy FM transmitter and qualifies as one of the best FM transmitters for your car. The Just all-in-one Wireless FM Transmitter is a great device that is comparable with any other transmitters available in the market. This device can connect your iphone to your stereo through FM using up to 206 presets, which means you don’t have to keep scanning to reach the optimum frequency. The device connects via Bluetooth. There is a 3.5mm jack for wired connectivity. The charging capability is built-in. The standout feature of this device is the rubberized adjustable sides that double as your dash-mounted phone holder. This reduces the need for more accessories. 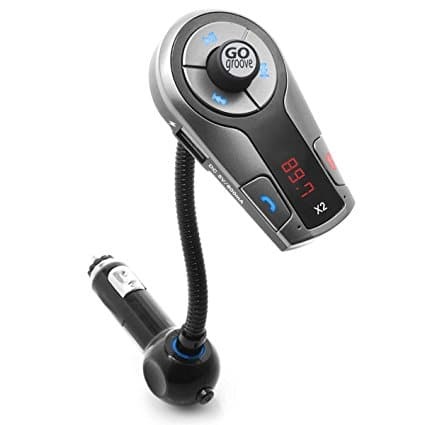 This Bluetooth FM transmitter is perfect for your car once you stick it to the cigarette jack. 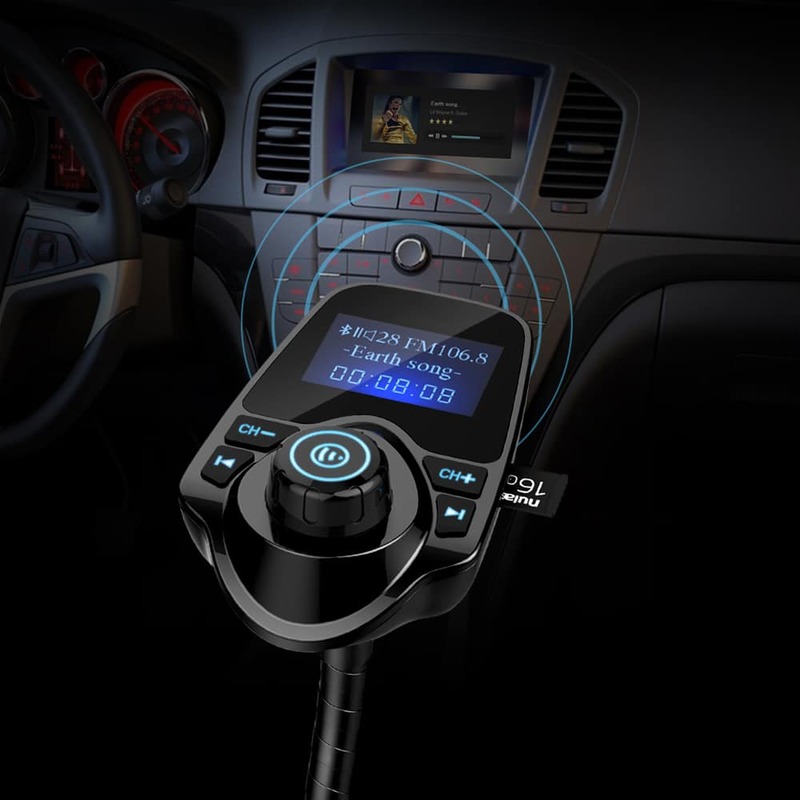 The design is sleek and suits all vehicles, but it is the features of this FM transmitter that sells. Plug this device into the USB port and connect wirelessly through the wireless Bluetooth for an audio experience that is second to none. The device has crystal clear audio clarity and the soft glow lights that add a nice ambience within the car for those long drives. 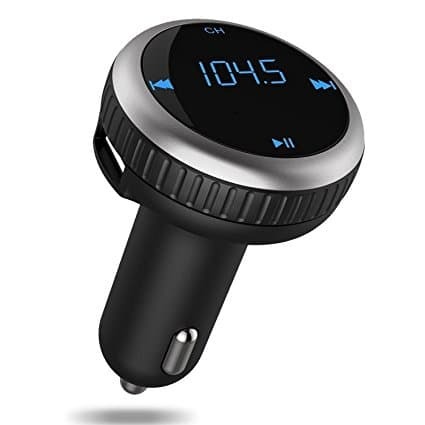 This device may not be the most good looking FM transmitters around, but this Bluetooth FM transmitter add an easy to use Bluetooth connection to any vehicle with the Cigarette jack. The built-in microphone ensures you can enjoy ample good quality phone calls. The flexible arm of the GoGroove Flex SMART X2 FM transmitter makes sure it fits with many car console designs. The USB and the line-in connections improve the user experience and allow it to be versatile.